Why Won't Jon Talk to Me? I realize that as a high and mighty US Senator, Jon Tester doesn't have to answer those petty questions from his constituents, but it is also telling that he has not answered an email question I sent out over a week ago. I just asked him "What is his position on the President's American Jobs Act?" I wasn't trying to call him out, but I was wondering how he would answer since he is running for re-election. Apparently, his silence is his answer. We all know about AttackWatch, the site where you are to report misinformation to the masters in the White House so that they can quickly quell dissent. I was inspired by the NY Post's BungleWatch, but I think that what we really need is a BotchWatch site where people can report all the stupid stuff the Government does. ( I just like BotchWatch better than BungleWatch.) We could even have it broken down to a FedBotchWatch, with subsets of the respective Department's BotchWatch, such as EnergyBotchWatch, AgBotchWatch, etc. You could throw in a state version as well, like (Insert name of appropriate state here )BotchWatch, and carry it on down to the local levels. It's probably going to take one heck of a server farm and more bandwidth than Blogger can host to run it, so anyone with the resources should be encouraged to go for it. Andy Hammond seems to have been reconstituted as THR 2.0. Go say Hi. If this wasn't real, it would be funny. Remember back in August when Obama said that he had a plan that was going to get the economy going again so people would have jobs, and how he was going to release the plan right after he came back from vacation? And how he wanted a joint session of Congress to announce the plan, and that they were trying to be cute and schedule it over the top of the Republican Debates? And how they tried to make Boehner look like a partisan for pushing it back a day? A day longer to wait for helping America get out of this economic mess, how dare he! I missed the speech because I was traveling to Helena at the time, but the snapshot review was all about how many times he said "Pass this bill!" Just one problem: There wasn't a bill. Nothing to be introduced by any member of Congress to be considered. Nothing to be scored by the CBO. Nothing at all. But that didn't stop Obama from hitting the campaign trail to demand that the Republicans pass his bill, the "American Jobs Act of 2011." He headed off to Ohio to campaign in Boehner's back yard, telling everyone to make the Republicans do their job and Pass! The! Bill! And still there was no bill. But in an interesting display of bipartisanship, Texas Representative Louie Gohmert, a Republican decided that he needed to introduce the American Jobs Act of 2011 on his own. Now his bill calls for reducing the corporate tax rate to 0%, and do away with the Alternative Minimum Tax. Just imagine Obama having to veto the American Jobs Act of 2011 that he called for the Republicans to pass. Some may say that this is just a cynical political game, and they would probably be right, but it is no less of a game than what Obama is doing in demanding the passage of a bill that hasn't been introduced yet. And the only reason that Obama hasn't introduced the bill is because it doesn't exist. It is simply a political prop that he thinks is a trap that he set for the Republican Congress. But he has been too clever by half, and too lazy to do anything to follow through. His lack of writing from his college days and his tenure at Harvard Review has carried on to his Presidency, where speechifying is used as a substitute for, well, you know, work. I am sure that someone in the White House had to ask the question about what should be presented. But maybe they fell for the myth about Obama being a genius, and no one would tell him that there was more work to do. If that's the case, we have a White House populated by people who cannot seem to see that the Emperor has no clothes, or ability to do anything but campaign. I think that I should report myself as well. I am probably biased, but I loved when Herman was talking about reforming government, and he was saying that people would tell him "You don't know how government works." And Herman responded that he knows how government works, "and it doesn't!" One of the things that I find interesting about our Leftist friends, is their continuing belief in the efficacy of government. This in spite of all the examples to the contrary. such as the government's response to Hurricane Katrina. The old joke was that Democrats promised if elected that they will make you taller, stronger, better looking and get rid of the crabgrass in you lawn. Republicans on the other hand promise the government doesn't work, and when elected prove it. Most of us have had our own experiences with government that leaves a less than satisfactory feeling about our "public servants." I had purchased a new truck and was given the temporary sticker while the processing for a new title took place. I kept checking the mail looking for the notice that the title was in so I could register my vehicle, but it never came. About a week before the expiration of my temp plates, I called to ask if the title was ready, and the worker there said they still hadn't received it from the car dealer. I asked if I could get an extension on the temp plates and was told that was not allowed. So I called the dealer, and he told me that he had sent it, and in fact had made a copy of the fax that he sent, since this had happened before. Once again, I called the DMV and they had suddenly discovered the title (seems it had been misfiled) and I could get my title done when I came in. Upon entering I took a number and watched. There were three workers for the title section, and one seemed to take an extraordinarily long time with one customer. Maybe he was registering a fleet of vehicles, but I was there for an hour, and he never left. One of the workers was cranking through customers, and I was really hopeful that I would get her, but my number came up with the third teller, who announced that she was going on break, and promptly left. I waited for twenty more minutes until she came back from her break and stated that it was so hot out there while she was doing her errands. Not wanting to take any longer by asking why she couldn't do that on her own time, I let it go. But it was a symbol of government and the private citizen's interaction. We are held hostage to the whims of the bureaucrat who holds all the power, rendering us, the source of all sovereign power as impotent as possible. When you complain about regulations, you always get the bromide, "What are you, against clean water and air?" As that was all that there was to regulation. Sure, I am in favor of clean air and water, who isn't? But the same regulations that supposedly protect us, are used to shut down a seven year old's lemonade stand, and tacked on a $500 fine on top of that. Or how about the whole drug war thing? When the mayor of Baltimore has his house invaded by a SWAT team, holding his family at gunpoint, shooting their dogs, and all because they went to the wrong house, are also instances of government in action. In Montana, my favorite example is the old "Reasonable and Prudent" law that removed the daytime speed limit. Oh, Woe! the pro limit crowd cried, there would be carnage on the highways! But a funny thing happened: Death rates on the highways went down. A lot. In fact, they stayed below the speed limit rate of deaths until the speed limit was reimposed, and then they jumped back up. Dramatically. So if you want to kill people, lower the speed limit seems to be the lesson to be learned. But we don't learn that lesson, do we? Also in Montana, we have a requirement that if you want to cut hair you have to have 2000 hours of instruction before you can get a license. North Carolina has a requirement that your barber only have 400 hours of classes. Are the haircuts here five times better? Or is this just a guaranteed stream of cash flow to the owners of beauty schools? How about DUIs? We all want to reduce and possibly eliminate DUIS, but we restrict liquor licenses so that you have to drive to go have a beer with your friends. Why can't we relax the licensing requirements and allow neighborhood bars that you could walk to, and then back home? Because the Montana Tavern Owner's Association has a vested interest in restricting the licenses in order to keep the prices high. And with the Liquor Control Board, don't even get me started on their Byzantine rules and regulations. There are plenty more examples that could be cited, but I am sure that each of you has your own private experience with inefficient and ineffective regulations and government. And if we get the government that we deserve, don't we deserve better? How many regulations keep us from gaining jobs in the Bakken oil fields that North Dakota feels aren't necessary? Why is it so hard to start a business with license fees, inspections, regulations that you know nothing about? when is enough enough? The idea that government works only for good is a false notion, a fairy tale that needs to be shown for the failure that it is. The government needs to get out of our day to day lives and get back to doing that which it is mandated to do and nothing else. Defense of the country, courts to address wrongs, and little else. There are many emotions with the tenth anniversary of the worst attack on our country. Some want to forget, having seen the horror so many times. I never want to forget, nor forgive, nor excuse, nor try to understand. There is nothing that can ever justify what was done on that day. It wasn't poverty, it wasn't oppression, it wasn't any logical explanation that caused nineteen hijackers who only wanted to kill as many people as they could. That was their goal, and they achieved a majority of their objectives. But the answer to their barbarism is to remember the best of our own humanity. Remember that many of the victims were those who were rushing into the buildings while others were rushing out. Remember that the intended victims of Flight 93 were instead the last line of defense in this attack. Those heroes will never be forgot. But we also need to remember those who exercised the hardest choice of all. Shortly after the attack on the World Trade Center Towers, it became obvious that people were trapped above where the planes struck. 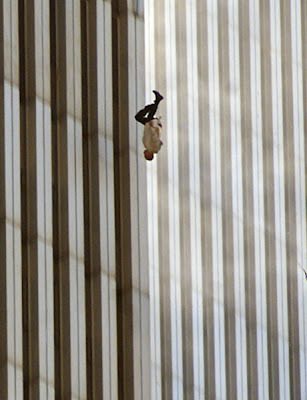 Some images of that time include people waving out of the gash in the buildings, seeking help which would never come. But the thing that I remember most of those who were trapped were the ones who when confronted by the choice of burning to death and ten seconds of falling to a horrible death chose the latter. That is a choice that no one should have to make, and the bastards that flew those planes forced that choice onto innocents who had never done them any harm. Afterwards, the pictures are still being scrubbed. Some say that the images of the jumpers is just too horrible, and that it will only inspire rage. And I would agree with them. But to sanitize by removing those images is to deny those who had to make that choice, the respect for their awful choice. We will never know who that man was, but to pretend that he doesn't exist is almost as serious crime as what caused him to have to choose. Will the image inspire hatred and fear? Probably, but also justifiably. The people who proclaim that their religion authorizes just this sort of thing, are not people worthy of any consideration. They need to be stopped by any means possible from ever doing anything that would force one more innocent to have to make the terrible choice that this man did. Never Forget. One could be angry, or one could just go ahead and admit that they pulled one over on us. Who? What did they pull over? The answer is "the Left" at least as far as being considered worthy of consideration. It started with the Holocaust shooter, and everyone said the Right was to blame. Then the guy who flew his Cessna into the IRS building, and once again the Right was to blame. Then we had Loughner deciding to shoot up the Arizona parking lot with Rep. Gabi Giffords in it, almost killing her, and the first call was the Right Wing Rhetoric, and later it was Palin's map with cross hairs on certain legislative districts. Remember them? They were all false. Every last one of them. And the Left doesn't care. After the Arizona shootings, we had Obama come out and say that we had to raise the level of discourse, and once again we fell for it. But they didn't. Calling people who believe in fiscal responsibility as "terrorists," "barbarians," "teabaggers," people who have to be "taken out." That is the new tone of civility, and that comes from the leadership of the Democrats, never mind the Leftie blogs who go even further in their reprehensible language. But when it happens and the "leadership" refuses to even say that is too much, then you know that we have been scammed. There is a tactical advantage to playing the rules one way only. Sure, civilized behavior would dictate that it apply to both sides, but the nihilism of the Left means that they don't have to be civilized. In fact, they relish their barbarism. After all, it gives them a juvenile sense of superiority, just like the kid who shot spitwads at the teacher's back in class, they feel they are "standing up to the man." Not that they really are, they're just being jerks, but it makes their immature feelings happy even while it does nothing. The advantage of being an adult, is that you have already lived through the juvenile stage and moved beyond it. As an adult, we can regress but they can never advance to becoming adult, because it is unknown territory for them. Well, I have a desire to go back and play in the sandbox one more time. The Left needs to be destroyed. They need to be eliminated from the face of the Earth. They are dangerous traitors who don't even deserve the bullet to the head that is waiting for them. Laws should be passed mandating that they immediately commit suicide, the sick bastards that they are. The Democrat Party needs to be outlawed as a traitorous entity that has no legitimacy, and all Democrat office holders need to be taken out, lined up against the wall and shot for their crimes against humanity. They are all so stupid, they have been blindly following their orders while working for the destruction of the country that has provided them the tools for them to use against us. No more! Rid the pests, denounce them in the public square. Exterminate them! Don't tell me to be civil, or that I might hurt their feelings. I don't care, they aren't worthy of the most basic considerations given to dumb animals, who are smarter than they are. But maybe that is too extreme, however pleasurable it might be. Let's just send them to their colonies that they have already established like California, New York, Massachussets and fence them in there. Let them continue their destruction of civilization in their own little fiefdoms, but rid them of having any say over the rest of us. Rant off. On Thursday, the President is going to give a speech that will be at 5 p.m. our time and 4p.m. on the West Coast. It will be the final explanation of his jobs plan that he promised he had developed, but has been keeping it secret since before he went on vacation. And I am sure that it will be a wonderful and fantastic plan! NOT. The problem with Obama, is that he doesn't seem to be as smart as his sycophants want to make him out to be. He is trying to use an address from the Capital to make up for an entirely boring rehash of what he has already promoted and had shot down. Oh, I am sure that there will be calls for unity and all that. I really doubt that even he has the chutzpa to call for a "civil" discussion. In fact, that canard has been destroyed if it had any life left with his introduction by Jimmy Hoffa jr. at today's Labor Day picnic and speech. I know I won't be alone in ignoring the President prattling on. Oh, I might wait for the news shows to see if there is anything there, but the chances of anything useful are about zero. He is caught between his base who demand that he become confrontational and institute even more radical failed policies on an even bigger scale, and the rest of the country that thinks he is clueless or out of his mind. In retrospect though, there is one thing that he could do that would dramatically improve the economy: Offer his resignation. Now that would be newsworthy.